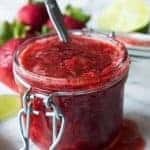 This Strawberry Margarita Dessert Sauce is the perfect topping for your ice cream, cakes, cookies, cheesecakes. Super easy to make, you will be using this on everything! Add all ingredients to a medium size sauce pan. Stir to combine. Heat over medium heat and bring to a boil. Reduce heat and allow to simmer for about 15 minutes. Strawberries will be tender and sauce will be slightly thickened. Remove from heat. Mash the strawberries to desired consistency. Cover pot and allow the sauce to cool for about 10 minutes. Spoon onto dessert or store in refrigerator. Sauce can be poured cold from the fridge or heated up in microwave and poured warm over desserts.